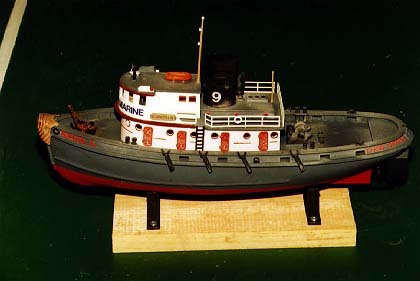 Lindberg makes a 14" model tugboat for R/C--I built one in the summer of 1995, when I was looking for a project to finish in finite time (less than two weeks, as it turned out) and that I could easily take on vacation. Here's a picture of it. Lindberg also makes a PT boat in a similar scale. I think it would work pretty well on an indoor pool, as long as there were no swimmers. I found it worked okay outside as long as the water was dead calm--it doesn't take much to swamp 14" of boat. It can almost turn in a bathtub and could probably turn full circle in a hot tub. The only complaints I have with the kit are that the provided drive unit tends to stall (it's a servo with the gears off, and it's not got a lot of torque) and that the deck sits on top of, rather than in, the hull (gunwales are molded as part of the deck)--while this simplifies manufacture and construction, it makes the freeboard perilously low. If I were doing it again, I'd: be very careful to minimize friction in the stuffing box, so the shaft doesn't stick; consider substituting a higher torque motor; and use a lighter receiver and batteries. Actually, just substituting AAA cells for the AA cells I used might improve freeboard a lot-or it might just make the boat less stable. If you're considering building this model for R/C, you may wish to consult the article Lindberg's Diesel Tug in R/C, by Jef Ruskin, in Model Ship Builder, No. 92, November/December 1994, pp. 39-42.